MJR Vision’s Integrated heads are enclosed in an industrialized stainless steel casing for maximum protection. Up to four print heads can be accommodated within to give a 2” print swath. Seamlessly included in this rugged housing is a print controller and a bulk ink system. 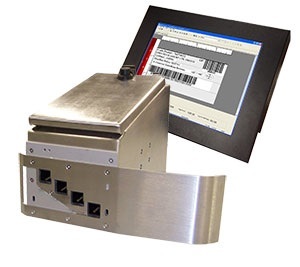 The integrated head has connections for external encoders, sensors and stack lights as well as a 10/100 BaseT port for connecting to an inc.jet User Interface or even external data sources. Two height options are available—standard print height (0.75”) or low profile (0.5”) - allowing for close to the conveyor applications such as printing on trays.